The Officer responsible to the General Manager for the commercial side of running the railway in each Region was the Divisional Commercial Superintendent. After the Great War a subscription enabled a memorial to be prepared for those men from the London Divisional Commercial Superintendent's Office who were lost in the War. The Essex member amongst those remembered was Company Sergeant Major 300073 Thomas William Madgwick. Thomas came from Walthamstow and joined the 7th Essex who were a Territorial Battalion in 1912 where he was Private 1730 Madgwick. He continued his service and in 1914 was mobilised into full time service. After training on 11 August 1918 with the rest of the Battalion he embarked for Gallipoli and fought his way through the Campaign. After leaving Gallipoli the 7th Essex continued their war in Egypt where Thomas was promoted to Company Sergeant Major. He was involved in the 1st Battle of Gaza on 26 and 27 September 1917 but he was one of those men who failed to return from roll call after the attack and whose body was never found. 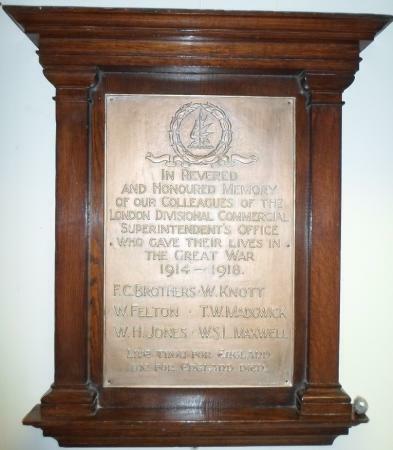 His death is commemorated on the Jerusalem Memorial and on the London Divisional Commercial Superintendent's Office plaque. Since the memorial was commissioned there have been several changes of management in the railways and the Superintendents Office is no more.